This entry was posted on February 14, 2010 at 12:35 am and is filed under Running Mechanics. You can follow any responses to this entry through the RSS 2.0 feed. You can leave a response, or trackback from your own site. This is an extremely interesting post. You’ve given me a lot think about. It will take me a while to go over it thoroughly point by point, but as you can see by my long winded entry, I already have some questions and comments. I would definitely agree with your point that an important component of the “fall” is actually momentum. However, this discrepancy might be due to differences between the Russian and English languages. My Russian wife has explained to me that in Russian the word for fall does not necessarily have the same connotation as it does in English, and that it would likely be understood differently when described in Russian. I don’t know if this is actually a source of misunderstanding, but I do know that Dr. Romanov’s English is less than perfect, and he does use Russian phrases in English that don’t translate well. Your alternate description of what is happening during the pull is confusing to me. Can you please explain further what is happening here? If the body falling, at certain point it is no longer supported by the leg, why would it be impossible to pull the leg to the body at that point? If pushing is needed, it must be very subtle. I say this because, when I’ve seen people actively push, they always seem to end up bouncing excessively. I do feel that you have misrepresented some things about Pose or more specifically the way it is presented. There is no question that Pose technique puts a greater stress on the ankle joint, and there is the risk of injury as you described. This is especially true when converting from a heel strike to a forefoot landing. However, this has always been explicitly stated every time I’ve attended Pose training. Dr. Romanov also recommends allowing for a significant period of adjustment before returning to hard training. Also, the fact that this receives less attention in the Pose literature is hardly surprising. Does anyone promote anything by emphasizing the negative? In any case, I have never seen any attempt to intentionally hide the facts, or deceive people on this point. Your statement that “there is a certain mysticism in the way that Pose is described” is very interesting. I have not found this to be the case. In fact, I find the description of Pose to be refreshingly devoid of mysticism, especially when compared to other running techniques like Chi running or the Alexander technique for running. However, this subject is highly subjective and therefore any debate would be meaningless. Concerning your statement “it creates an illusion that puts us at risk of failing to develop adequate strength of muscle and sinew to withstand forceful eccentric contraction”, I also find this to be somewhat unfair. If indeed it is an illusion, whether or not it puts us at risk of not developing adequate strength is speculative. Especially since there are a lot of leg strengthening exercises recommended for Pose training, and many of them are for developing the strength needed to accommodate the eccentric contraction used when landing. Also, I have never encountered a runner who even thinks about the ground reaction force, nor have I seen many runners do any special exercises to prepare for it regardless of their understanding of running technique. This seems to indicate that they concluded exactly what he is teaching in Pose, which is that gravity pulls the body forward with the use of gravitational torque. Dr. Romanov claims that the energy for forward motion is supplied by gravity, he does not claim that the energy of recovery and set up for the next fall (the Pull and Pose) is supplied by gravity. That work is done by the runner. Could you please elaborate. I’m not seeing your argument falling together base on the paper you referenced. Correct or not, it seems to me that he is very consistent in his statements, and they don’t seem to be hiding or obscuring what he believes. Wow, that was in in-depth look. I’m glad I managed to follow most of that. It was the assertion that gravity is a source of energy in running that I could never get my head round because it’s pulling me into the ground rather than forwards, so I definitely agree with your assessment here. However, since I don’t have a grounding in physics I’m not in a position to discuss details. Thanks for that, I found it very interesting. I hope you don’t get swamped by some pose fanbois. The theoretical aspects of Pose sometimes seem to cross the boundaries between perception and physicality which can make for a confusing picture if you are using it to understand the mechanics of running. If you use it simply to learn how to run, it works fairly well as you say. Ultimately, the mechanics of running seems to be a simple choice of working with the external forces or trying to create the movement in defiance of the external forces. As an example, a constant pace runner will be roughly symmetric around midstance; footfall will be as far ahead of midstance as footoff is behind midstance. In that scenario it is easy to see how gravity is neutral and the runner only has to use enough muscular action to maintain alignment (ignoring repositioning of limbs and getting airborne for now). Now take the runner that believes they need to push off to maintain pace. They add some push from midstance to footoff which makes them fly higher, spend longer on stance and also adds some propulsion. They are running constant pace so they now have excess propulsion not to mention that the trailing leg requires the forward leg to go further forward to maintain balance. Then they land further forward and incur more braking and so maintain pace. They have added in muscular effort for no gain. That may sound like a silly example, but the sad truth is that is the way many people run and under-perform picking up injuries to boot. Ken, thank you for your detailed comments. The problem with the concept of the pull is not with the pull itself but that the way the sequence of pose, fall, pull is presented minimizes the role of ground reaction force. This fails to provide any mechanism by which the centre of mass of the body is lifted. Yet getting airborne is what distinguished running from walking. It makes running faster than walking but also increases the risk of injury. Therefore it is important to include this aspect of running in a biomechanical theory. With regard to your query about the exercises that runners do to increase their ability to sustain eccentric contractions, virtually all plyometrics done by runners is directed at this goal, and many exercises such as one leg squats contribute to developing the required strength. It is true that Dr Romanov advocates some plyometrics and you will note that I listed his advocacy of developing strength as one of the positive features of Pose. However, most runners have limited time to spend doing exercises, it would be best to design one’s exercise program on the basis of a realistic understanding of running mechanics. Even Cabletow, whom I regard as a good coach and who had advised me that allowing the heel to brush the ground was consistent with Pose technique at the Loughborough meeting in 2008, presented what I consider to be a misleading argument against the point I was making on the PoseTech forum thread. His response focused on the technicality that figure 38.27 in Pose Method of Running (the widely publicized picture of Dr Romanov that is described in the caption as the perfect pose) was in fact a picture of late stance rather than midstance. I agree that in contradiction to the caption, the picture was taken somewhat after midstance. However when labeled with the caption ‘ perfect running pose’ I consider it is misleading. In an email to me in December 2009, Cabletow stated that he is ‘less in line with pose pedagoguey than most’ and that he considered that Dr Romanov’s heel had probably touched ground near midstance. However in his posting on the Pose Tech forum attempting to refute my arguments, he made no mention of his belief that Dr Romanov’s heel might have touched the ground. So my experience is that the problem is obscured in the Pose literature and on the PoseTech website. I agree that Chi places more emphasis on mysticism that Pose. Furthermore, in general the responses by Pose coaches on the PoseTech website forums have become much clearer in the past three years. A few years ago the responses were often very confusing. Among many examples, I remember when Olicav tried to get a clear answer to his question about the need to arrest the rotation induced by gravitational torque. The responses from Pose coaches were a confusing jumble of ideas with little basis in physics or biomechanics. However I still find Dr Romanov’s views on gravity obscure because he mixes attempts at biomechanical analysis with irrelevant (and incorrect) statements such as gravity being the strongest force on earth. On page 15 of Pose Method of Running he states ‘I want you to become a complete runner, working in harmony with nature to softly and swiftly pass over the ground beneath your feet.’ This is a noble and potentially inspiring sentiment, but his serious under-estimation of the forces required to get airborne (as he undeniably does in figure 7 of the paper entitled ‘Runners do not push off the ground but fall forwards via a gravitational torque’) is not a good way to achieve harmony with nature. Regarding your comment on the paper on accelerated running, my main concern is the contradiction between the evidence which the authors interpret as showing the maximum horizontal GRF occurs much later in the gait cycle than maximum horizontal acceleration of the centre of mass, and Newton’s second law of motion, which the authors correctly present in equation 1a. They make no mention of the paradox. I think that it is most likely that there is some problem in their computation of the time of maximum acceleration of the COM – but without access to the raw data this is only speculation. With regard to the authors statement “Gravity completes no net work during stance in constant speed running, but achieves angular work via a gravitational torque accelerating the COM in both constant speed and accelerated running.”, I agree entirely, but unfortunately the work done by gravitational torque after midstance is of limited help because it must be compensated for some other torque that reverses the rotation if a face down crash is to be avoided. Simbil, Thanks. I think we agree that the illusions created by Pose theory can be helpful in getting off stance quickly. I listed the Pose emphasis on a short time on stance as one of its positive features. In contrast, Gordon Pirie (whose book ‘Running fast and injury free’ has contributed even more to my ideas than Dr Romanov) recommends spending longer on stance to allow the generation of a greater push. I think that Pirie is wrong in this recommendation. While the illusion created by ‘pose, fall, pull’ can promote a rapid lift off from stance, paradoxically a shorter time on stance necessarily requires a stronger push against the ground. I think that failure to recognize this creates a risk of inadequate preparation for the eccentric forces necessary to achieve the required elastic recoil, thereby reducing the likelihood that one will achieves one potential maximum performance while increasing the risk of some injuries. Nonetheless, I accept that a misguided attempt to exert a forceful push is even more risky. My personal goal is to develop the optimum mental picture that allows me to get off stance quickly and safely. I believe that this is more likely to be achieved by a correct understanding of biomechanics. I don’t think Pirie is saying try and maintain contact on the ground for longer, it is just the consequence of running with more bend in your knees than those around you running at the same pace. “I don’t think Pirie is saying try and maintain contact on the ground for longer” meaning actively trying to keep your foot on the ground. SPR, I agree that in Pirie’s account, remaining on stance longer is a consequence of the bent knee. I regard his wording about generating a greater push as a result of a longer time on stance is nonetheless potentially misleading. One should distinguish the force of the push, which is greater when time on stance is shorter, and the impulse produced by the push (force x time) which might be greater with a longer time on stance. I believe we should aim for a strong push and a short time on stance, but we need to be careful how we achieve this. It is of course difficult to get the wording totally correct in all respects, and in general I regard Pirie’s book as a very valuable source of ideas. If it is of limited help, then you should not need to lean forward to run right? However, I know that when I lean forward from a stationary start, I move for ward very easily, and more I lean the faster I start moving. I can string these standing starts closer and closer to gether until I’m running. In doing this, I can eliminate the possibility that I’m using anything more than gravitational torque move forward. I know this not a scientific analysis, but it causes me to be sceptical of your statement that gravitational torque is of limited help moving forward. Dear Ken, I believe that the fall does promote a reflex response that involves pushing harder. This is helpful when accelerating from a stationary position and might be of some value when running at constant speed, but its role is more limited than implied by Pose theory. I look forward to your work regarding a rigorous biomechanical model of running and how a runner might achieve it. In the meantime, I don’t think you should discount the role of gravity (to create horizontal GRF) just because it has not been explained in a way that works for you. Keep in mind one of the simplest forms of movement; unbalance, fall and catch – taking a single step and stopping. It undeniably results in movement with gravity doing indirect work that displaces the person horizontally. The correction of rotation and regaining of height happens at landing in this case and that is the cost that makes gravity overall neutral. Gravity being overall neutral is not the same as saying gravity was not motive as gravity was instrumental in creating movement. The importance of that movement patter is in the concept of supporting a movement rather than driving the movement. Someone with a wooden leg could perform the same movement if they started by falling from their wooden leg and caught the fall with their good leg i.e. the support leg does not need to provide a push from muscular contraction – it just supports the fall. Clearly running is more complicated, but the usefulness of gravity should not be discounted. As stated in my response to Ken, I believe gravity can prompt useful muscular contraction, as would be the case in the example you give of the person with one wooden leg. I also accept that the Pose concept of the pull can be very useful in practice even though the associated theory fails to take explicit account of the push. Furthermore, I started my post with a list of the positive points of Pose. However I believe it is peculiar (if not actually perverse) to persist in promoting a theory that is based on errors such as that illustrated in figure 7 of the paper by Romanov and Fletcher with the misleading title ‘Runners do not push off the ground but fall forwards via a gravitational torque.’ By all means promote the use of helpful imagery just as Alexander technique teachers promote useful imagery, but it is not reasonable to promote an underlying biomechanical theory that is wrong. Furthermore, it is not acceptable in my mind to underplay the adverse consequences of a running style, such as the risk of increased stress around the ankle (which Ken argues is understandable) when a relatively minor adjustment could reduce the risk. Great article again, I whole heartedly agree with you about your thoughts on pose, the biggest problem is they forget that it is a powerful knee drive using the hip flexors that produces a faster and longer stride in fact peak performance posted an article stating that the hip flexors were the number one muscle that a runner should strengthen for improved performabce. Allso sometime ago i read in PP that a bent leg on landing greatly reduced the running econemy of distance runners. Rick, Thanks for those comments. Knee drive and knee bend are two aspect of running that are difficult to get perfect. I consider that the Pose approach of focusing on hamstring pull rather than hip flexor contraction to drive the swing is perhaps safer but neither the most efficient nor the fastest way to run. Focus on hip flexor action to get the swinging leg forward runs the risk of over-striding if the forward swing is not well controlled. I believe that an elite athlete, especially when running distances ranging from 400m up to 10 K, should actively work on strengthening the hip flexor action and on the subsequent control of the swing by a hamstring contraction in late swing. For the amateur, the Pose approach of focusing on a hamstring pull at lift-off with minimal conscious attention to muscle action in late swing is probably safer. In the final stages of swing, it is necessary to adjust the relative tension in flexors and extensors to optimize the capture of elastic energy at impact, so unless one has the time and the bodily awareness to perfect a new swing style, it is probably safer to rely on the autopilot in our brain to control the second half of swing. Similarly, a flexed knee will result in longer time on stance as Pirie noted, and this is not the most efficient way to run. I believe that styles such as the BK method which place greater emphasis on a stiffer leg have the potential to be more efficient. However unless the muscles, sinews and bones are very well prepared for the forces that are transmitted via the stiffened leg, I believe that this style carries a greater risk of injury. So for the amateur or indeed for the elderly runner with more vulnerable joints, Pose with its emphasis on a flexed knee might be safer. One general point regarding approach to running style where I definitely disagree with Dr Romanov is that there is not a single answer to the question of the best way to run, irrespective of speed, distance or long term goals. For those of us who want to run fairly fast even in old age, we need to be aware of the advantages and disadvantages of the various different features of running style; make the best choice according to our goals; and then work on ensuring that our muscles, sinews and bones are well enough prepared for the style we had adopted. The effect of gravity goes a bit further than just prompting useful muscular contractions and giving useful imagery – it gives rise to horizontal movement, which was the whole point of the wooden leg analogy; gravity can give rise to cyclical horizontal movement so long as the person is returned to their original height in order to repeat the process with each cycle. That is the basic principle of gravity being a (horizontal) motive force and the essential theory is sounds as far as I can see. How that applies to running exactly, I simply don’t know. I don’t think it should be discounted though and I’m not sure why you seem to have discounted this fundamental mechanism, though I understand why you don’t appreciate some of the more detailed points surrounding it. I cannot think of any good alternate movement patterns to cause forwards motion with little waste and good biomechanical synergy. Pushing type mechanisms have the inherent problem of giving rise to excessive upward motion. Paw back type motions give rise to reverse torques at the hip and also unwanted leverage across joints. How do you take your first step when you start to run or walk? Do you fall forwards or do something else? thank-you so much for that post. I do agree with you on the summary of the helpful aspects of the Pose technique..but now I can see how fundamental the errors in the biomechanical explanations are. It isn’t just a mis-understanding in the ‘small print’ of the Method, but a very central one. You’re right that it seems bizarre to persist in including a totally flawed theory alongside what’s actually a helpful method of learning to run. I have a very different experience to you with regards warnings about potential problems from learning the Pose Method. I have spent the last 9 months having personal lessons from an excellent official Pose coach. I intend to continue to run as he’s taught me. Canute states on this blog that he has a fairly positive view on how Pose works in practice..and I would echo that, I am not ‘anti-Pose’. During my first 8 weeks of learning I had dreadful calf cramps, and some ankle pain. When this was queried with my coach it was always attributed to errors in my technique..never to stress from the new running style. In my copy of the Pose Method of Triathlon Techniques it clearly states that ‘In the course of a training run, you might experience cramping in your calves, a sharp pain in the ankle…..your pain or injury must stem from a flaw in your technique’ It was very good to read that you had better advice, and the injury potential of Pose was recognised by Dr Romanov. I do not deny that gravity has an influence on the events within the gait cycle. However, as we have discussed previously, at constant speed the rotation induced by gravity during late stance must be compensated for within the gait cycle. I believe that in the absence of wind resistance the compensation comes mainly or perhaps even entirely from the opposite torque in early stance. You have previously proposed that horizontal GRF might cancel the torque. Whichever of these mechanisms plays the larger role, cancellation must occur, so the effect is ‘to and fro’ rather than consistently forward. The major effect of gravity after mid-stance is to oppose action of vertical GRF, thereby decreasing the rate at which we become airborne. In the second half of swing phase and during early stance the COM falls. We recover some of the energy we spent overcoming gravity in late stance and store it as elastic energy. However we only recover a fraction of this energy and it is important to ensure that our muscles are well conditioned to sustain the eccentric contraction so as to maximize the amount of energy retained. You might also note that after midstance, the COM actually rises in response to vertical GRF. During constant velocity running, there is in fact no actual net fall between the ‘pose’ at midstance and the ‘pull’ that is possible after unweighting. Unweighting occurs largely because of the upwards push of GRF, and gravity opposes this. Gravity probably plays an additional role when one takes the first step from a stationary position. Although I have not examined video recordings of this first step closely enough, my impression is that the centre of mass falls during the first step, so gravity might possibly provide net energy during this step, but this gain in energy will have to be paid back in the subsequent few steps. When a sprinter starts from a crouched position, there is a definite price to pay to elevate the body over a period of about 5 steps, but the crouched position makes it possible to exert a stronger backward push thereby increasing horizontal GRF. Thanks for your comment. As you remark, I do have a positive view about how Pose works in practice, but I am disappointed by the fact that Pose coaches often blame the learner for ankle, Achilles or calf problems, when the primary cause of these problems is the increased stress around the ankle. These can be dealt with, first of all, by ensuring that the learner does not attempt to maintain plantar flexion throughout the time on stance, and secondly, by emphasizing the importance of increasing strength of the calf muscle and the Achilles tendon. Good luck with your continued practice of Pose. In your first paragraph you suggest that the creation and correction of rotation gives a ‘to and fro’ effect. I want to be absolutely clear on this point – the overall neutrality of the force does not mean that net movement cannot not occur as a result of that force. This is demonstrated in the wooden leg fall, catch and stand example; net neutral gravity but forwards displacement, no net loss in height, no end rotation i.e. the person has moved forwards from A to B. So simply stating that rotation must be cancelled whilst true does not mean that gravity cannot still be motive. Your next two paragraphs talk about the detail of what might happen in running but are rather moot until the central issue of gravity being neutral and motive (as demonstrated in the wooden leg example) is acknowledged or reasonably dismissed. In your last paragraph you acknowledge that there might be net work done by gravity in the first step and that this needs to be paid for at some point – I agree entirely, the body needs to be lifted to its original height again as in the wooden leg example. The point is that payment is in the vertical whilst the desired motion is in the horizontal; the difference between the 2 means it is motive horizontally. The movement is influenced by all the forces acting on the body, and gravity is one of those forces. The reason I stated that gravity might act as a trigger to muscle action is that the only source of energy is muscle contraction (except when the wind is behind the runner). In this sense, gravity might be a trigger to muscle contraction. Indeed I believe that in running gravity plays a major role in triggering muscle contraction in late swing phase and early stance – in fact this is when the fall occurs. The wooden leg analogy has some similarity to the ruler model of running which we have discussed previously. It is true that if a ruler standing on end on a flat surface is allowed to fall, and then is caught by a human hand which then lifts the ruler and straightens it by sliding the base along the surface to a position under the COM, that the ruler will progress across the surface. Gravity plays a role but the human hand or arm does the work. I would be inclined to say that gravity elicited the action of the hand and arm muscles. Perhaps you consider that way of saying it undervalues the role of gravity. The crucial fact is that this is a poor model of running at constant speed because the fall in running actually occurs in late swing and early stance rather than late stance which is the stage at which Pose theory claims it occurs. However if you are proposing that gravity does useful work in late stance at a time when the COM is actually rising rather than falling, then it must be because rotational motion is useful. I would argue that the main use of this rotational motion is to correct the opposite rotation induced by gravitational torque in early stance and by wind pressure, but that is not what Pose theory proposes. Just to be clear, I am not proposing a detailed model of how gravity works in running, so no I am not proposing that gravity does useful work in late stance. My only point here is the simple one that you can clearly see how gravity works in the wooden leg model and it is conceivable that there is a mechanism in running that also utilises gravity. You state in your first paragraph that muscles are the only source of energy. I agree entirely – muscles lift us up and reposition our limbs. I am suggesting that gravity takes us forwards and that indeed the muscles need to lift us up to compensate. Once muscles have lifted us up we have potential energy that we can convert to kinetic energy by falling forwards again. There is no violation of conservation of energy in what I am saying. In your second paragraph you address the heart of this issue but seem to miss the critical point. In the wooden leg example, gravity creates a horizontal GRF which is opposed by friction and this force causes the person to fall forwards and downwards (rather than just downwards). They then catch the fall with their good leg and swing the wooden leg forwards whilst raising themselves up. All the muscular work is doing is repositioning limbs under the COM and regaining height – it is not moving the COM significantly forwards. The work provided by gravity is the main player moving the person forwards. Can you accept that gravity is moving the person with the wooden leg forwards and that the muscles play no significant part in the forwards movement, only the repositioning and regaining of height? I think we are in agreement about the essence of what happens in the ruler (or wooden leg) model. There are many situations in which gravity interacts with ground reaction force to produce horizontal displacement, provided the centre of mass of the object ends up lower than at its starting point. A ball rolling down hill is an example. Dr Romanov’s misleading analogy of a tree felled uphill is another. The crucial fact is that gravity does work only when the COM falls. If you produce a series of such horizontal displacements by employing muscles to lift the object back to its starting height repeatedly, I would be inclined to say that the muscles played a significant part in achieving the total horizontal displacement but perhaps we are only debating the meaning of the phrase ‘played a significant part’. As you say, you are not proposing that the ruler model is a model of running. I do not think there is anything mysterious about the contribution of gravitational torque to the movements involved in running at constant speed on a level surface in the absence of wind resistance. Because its effects have to be cancelled within each gait cycle, gravitational torque produces a balanced ‘to and fro’ motion. Because it generates no net forward motion, I think this ‘to and fro’ motion is of limited importance when running, though perhaps it might contribute to a subliminal sense of instability at the end of stance that helps trigger the muscle action that propels the forward swing of the leg. When there is wind resistance, I think that gravitational torque does play a more important role. While we are on stance the wind induces a head back and down rotational motion. Gravitational torque cancels this rotation, though of course, the work of pushing us forwards against the wind is done by the muscles. Although I think that gravitational torque plays only a minor role in running unless there is a strong head wind, that was not the main point of my post. The main claims that I made in my post are that gravity provides no net energy for running (even Dr Romanov agrees with this despite the unhelpful analogies he provides in Pose Method of Running); and that Pose theory underestimates the role of ground reaction forces, thereby failing to account for how we become airborne. Getting airborne is the key characteristic that distinguishes running from walking. It is what allows us to run faster than maximum walking pace, but it brings with it risk of injury. An adequate biomechanical theory of running must account for how we get airborne. An efficient running style should promote the efficient capture of gravitational energy as elastic energy and the use of that elastic energy to get airborne again. This is best achieved with a fairly short time on stance. I believe that despite the fact that Pose theory does not account for the forces that get us airborne, by encouraging a rapid pull it does promote a short time on stance and hence unconsciously promotes the associated strong push against the ground that gets us airborne. I believe that some Pose drills including ‘change of stance’ probably help develop quick reflexes that engage the muscles involved in getting airborne. Thus I think Pose does work fairly well in practice, despite being based on an inadequate theory. However by failing to account adequately for the essential characteristic of running, namely getting airborne, it creates a risk that the runner will not maximise development of the strength and power required to achieve maximum performance, and might also increase the risk of some injuries. Thanks Canute for a most interesting post. One of the main problems with Pose (as I see it), is that it’s like a religion — where you’re either a believer or a non-believer. Running style (or form), is not black and white. There is classic “good style” that you observe in the likes of Bekele, but teaching that style to an 80kg marathon runner might not result in a faster marathon time for that runner. I like your idea of using some elements of Pose if that helps the runner to avoid injuries and run further, and/or faster. My observations are that faster runners do “get off the ground” with some force. Still photographs of elite runners mid-flight show them a distance off the ground that couldn’t be achieved by “falling”. I’ve observed this in both middle-distance runners and marathoners. Looking forward to the drills and exercises you’d recommend for safely developing a “strong GRF”. The “Magill” drills I’ve been doing seem useful, but maybe I should do them more than weekly. I’ve tried both Pose and ChiRunning and Ewen is right, they are like a religion, you can get sucked into the cult and start to believe everything your ‘Guru’ tells you, you end up feeling obliged to defend your new religion against people who challenge the Guru’s way! But if you have a strong belief that say pose works you can get a placebo effect that might in fact make you run faster, until some one like you Canute comes along and breaks there dream that gravity can pull you forward! In your paragraphs except for the first you raise several interesting points and I largely agree. However, you need to bare in mind that Pose is a framework to learn how to run more than it is a rigorous theory of movement (that’s obviously in my opinion, many Posers may disagree) and that means that it is concerned mainly with the very essence of running which is going forwards with all other concerns subordinate to that one. So it is not arranged in a manner of what costs more energy. You make the point again that gravity cannot provide net energy which I have also made clear myself, we are in total agreement on that point. Your first paragraph addresses the main issue I am trying to discuss and I am pleased that you can see how gravity can be horizontally motive in a scenario where it is allowed to do work so long as the work is paid for by raising the COM again at some stage. That’s really all I wanted to get across to you. I don’t expect you will see any use for gravity in a physical sense in constant pace running as constant pace running by its nature needs little propulsion to keep it going. Where gravity becomes more obvious is in accelerated running and in particular before midstance in a heavily accelerating runner when the runner has their COM ahead of support i.e. all the conditions for falling forwards and downwards whilst still dipping on stance. The GRF in late stance then is responsible for further propulsion and correcting the forwards rotation from early stance. If the GRF in late stance is there anyway (as a consequence of forces more concerned with getting airborne), then the motive force is gravity, at least from the perspective of what changes are made in the gait to affect acceleration if not in magnitude. This becomes important for teaching running as the focus becomes one of leaning forwards more rather than consciously pushing harder. It will be interesting to compare your model of running and what that tells you to focus on with the other running methods, I look forward to your future thoughts on this fascinating subject. Ewen and Rick, You are right about the religious aspect of Pose and about the power of belief. I hope that by being a skeptic I do not do harm to myself or others by abolishing the placebo effect. Before getting back to the mechanics of foot dynamics and getting airborne, I want to address the psychological aspects of Pose. Although the placebo effect is a powerful agent, I believe even more strongly that having faith in something that makes sense can be even better – the goal is to combine the power of faith with the power of good mechanics. We are largely in agreement about steady paced running and I think we also agree that acceleration raises some interesting issues. Observation of a sprinter starting from blocks suggests that both gravitational torque and horizontal ground reaction force play an important role in acceleration, though ultimately the muscles do the work. I also believe that when one wants to accelerate whilst running, it is probably useful to focus on increasing lean rather than pushing harder, though of course one needs to be careful to avoid leaning from the hips as this would diminish the degree of extension of the hip in late stance and therefore weaken the potentially helpful pre-loading of the hip flexors. Cadence should probably also increase at least a little, though I note that at present when I increase speed, the increase in my cadence is greater than the increase in stride length. I suspect this mainly reflects a relative lack of muscle strength, but it might also be at least partly a matter of style. I was interested to note when experimenting with foot dynamics a few weeks ago (following comments from Rick) that focusing on landing with slight dorsiflexion of the foot, but still taking the load on the BOF, that I could accelerate with an increase in stride length that was relatively larger than the increase in cadence. This suggests that I had been losing power as my plantar flexed foot rotated downwards, in the manner proposed by Dr Lieberman based on his studies of barefoot runners – so maybe we should also be a little cautious about how we respond to the new barefoot ‘religion’. Ultimately the muscles do the work is undeniable – they are our only source of energy. That does not mean that gravity does not do horizontal work though – it just means it is paid for by the muscles doing vertical work. Anyway, that seems to be getting circular so maybe we should leave it there. Barefooting is a varied mix of ideas. I think there are some good principles involved, but the underlying idea that running barefoot will fix you by making you run naturally is not often the case from what I have seen. A bad shoe makes it hard to run well, that does not mean no shoes makes it easier to run well. Regarding stride length, I find that an odd measure to use as an indication of good running form or even performance. As I see it, stride length is a function of speed and how high you go between steps (which determines cadence). So if you want to increase speed, then stride length and/or cadence must increase. If you want to increase stride length itself, you can do so without any change in speed simply by bounding along so you go higher between steps. Bounding is likely to be more energetic, but I can’t really see why it would be an aim in itself or a measure of anything significant in itself? The model I keep in mind for efficiency is the wheel; support under COM, very short time on support, very quick change of support, no vertical oscillation. Obviously we can’t do that on out legs, but we can aim for minimal vertical oscillation, short time on support and quick change of support. The more you deviate from that, the more you will have to land ahead of the COM causing braking and injury risk. You may be tempted to do so in order to reduce average ground reaction forces, I think that could be problematic though as injury risk is greatly increase by shear and bending forces and these increase the more the runner lands ahead. Landing closer to the COM means most of the forces are compressive and although larger, the body is better equipped to deal with them. Stride length in itself is not the important measurement. As you know speed = stride length x cadence. Up to a certain point (perhaps around 200 steps per minute) it is definitely more efficient to increase cadence. However beyond that point, running becomes less efficient, probably because the recovery of elastic energy is less efficient. I find that when I sprint my cadence increases to around 245 steps per minute. I suspect that this is beyond the point of maximum efficiency and therefore I have attempted to find a way of achieving the same speed at a cadence in the range 180-200 steps per minute. I did succeed in doing this by adjusting foot dynamics, at least during one brief session a few weeks ago. Since then a recurrence of inflammatory arthritis has clipped my wings so I have not tried sprinting recently. The question of the optimal amount of vertical oscillation is an interesting one. As we have discussed previously, the essential difference between running and walking is getting airborne. Getting airborne allows us to go faster but necessarily entails vertical oscillation. The reason that higher cadence is more efficient up to a certain point, is that with higher cadence the amount of work per km spent getting airborne is less. However, once we reach the limiting cadence where recovery of elastic energy deteriorates, it is more efficient to increase stride length. That demands greater vertical oscillation. One of the major differences between running and wheeling is that recovery of elastic energy makes a major contribution to the efficiency running. I think vertical oscillation should be just enough to allow for change of support. What sort of speed are you sprinting at – 100m flat out? If you watch sprinters, you will sometimes see 260+ cadence if I remember correctly. Bolt’s record breaking 100m had an average cadence of around 247 (it took him 40 steps). I would work on your control at high cadence. I suspect your form will be getting worse before you hit your max. I’m sure you could run faster if you could comfortably maintain 245 (I mean comfortably in a co-ordinated sense – clearly it will be taxing). Increasing stride length sounds like a really bad idea to me, more air time will mean higher ground forces coupled with a more stretched out gait – that is asking for trouble. Where did you get information regarding a decrease in elastic efficiency at higher cadences? There are a lot of comments about the religiosity of Pose and Chi running people. I think there is a little bit of religion going on here as well. If anyone believes the ideas presented in this blog are the absolute truth, then they are just as guilty of looking for a guru. The truth will have to be shaken out by the scientific process, and each model will have to be judged on its ability to predict the results of future experimentation. I think the ideas here are very intriguing. However, I’m neither convinced nor am I unconvinced of their validity, and I feel the same about Dr. Romanov’s ideas. I’ve seen Dr. Romanov present alternative explanations and supporting data, and since am not expert in Biomechanics, I’m not going to pretend that I’m competent to make the determination of which model best represents reality. Ken, I think you are right to remain sceptical about this site and about Dr Romanov. And I am grateful for your comments. My hope is that people will feel free to express their opinions in their comments. Hi Canute moving away from pose for a bit, can you tell me why you think B K Method offers the fastest way to run? I discussed the question of stride length and cadence in a post on 31st Dec 2009, and in that post I referred to some of the evidence regarding loss of efficiency at high cadence. I agree that world class sprinters can maintain 240-260 steps per minute with a stride length well over 2 metres. I am fairly sure that when I was younger my stride length at top speed was over 2 metres. However, I was more interested in the marathon than the 100m and I never actually had my time recorded when sprinting. In fact I have only ever run one 100m race in my life and that was at age 62 (time 15.8 sec – so I should definitely stick to marathon running rather than sprinting). Now, when sprinting at maximum effort with my usual style (moderate plantar flexion at footfall) my stride length is 1.65 metres, cadence is 240-245 steps per minute, and speed is 92 metres in 15 sec. I do not think the slightly faster speed with the longer stride was simply due to a more relaxed style at a lower effort level. My speed does usually increase as I increase from 90% to 100% effort. However the final 10% of effort with my usual style results in a relatively inefficient increase in cadence, without commensurate increase in stride length. I suspect I lack the muscle power to maintain an adequate stride length at cadence over 200 steps per minute. It is very typical for elderly runners to suffer loss of stride length while maintaining cadence. It seems sensible to work out how to recover something approaching my youthful stride length. The fact that I can achieve a slightly faster speed with less effort when running with a longer stride supports this. However, these observations are based on a limited number of observations, so I would not want to claim I have the final answer yet. Rick, I do not know of any definite evidence that BK is faster than Pose, but I think that it has the potential to be faster because the tension maintained in muscles and tendons is likely to result is a more rapid elastic recoil. However I would not recommend BK for anyone who does not have the time and determination to develop the required strength. For an old timer like myself, I would rather adopt a more relaxed style. Maybe I will not run quite as fast, but I expect that a more relaxed style offers a greater chance of maintaining a reasonable pace into advanced old age. As I remarked in a response recently, I do not think there is a single answer to what is the best style. I think one has to decide on one’s goals and then adopt the style most suited to those goals. I went back to the article and had a read – I agree that developing strength and elasticity through specific training and plyometrics is a good way of allowing your body to automatically select the right stride length for your desired pace. Weak runners or runners with insufficient strength to handle their weight are easy to spot – they shuffle to increase time on stance which decreases ground reaction forces. I agree that will appear as a shorter than ideal stride length for the given pace and it would probably also have the characteristics of landing ahead, pushing to the rear and being quite straight legged. I suspect there is a lot of technique involved in sprinting, or really, the technique that you have is challenged by sprinting and it is speed that will uncover your problems most dramatically. Many runners I have seen that are poor sprinters (including me) seem to lack timing in that they cannot switch from supporting the body to recovering the leg fast enough, yet they have good functional strength. The result is that although cadence increases with speed, the landing starts to become too far forwards in balance with the trailing foot being recovered more slowly. The landing ahead introduces braking which prevents more speed – running just gets more painful, not much faster. What that kind of runner should work on is their likely limiting factor – neuromuscular response plus iron out any habitual over extension to the rear. I would suggest if you’re single legged hops are increasing showing good strength and elasticity yet your sprint ability is not improving, then neuromuscular response is the area you need to look at. Your plantar flexion experiments show interesting results. Its hard to guess what might be happening there as changing the degree of plantar flexion no doubt causes a few other changes in your gait. If I did that experiment, I would want some objective view of what was happening with my gait i.e. good slo-mo video before drawing definite conclusions. It is encouraging that whatever the causal factor, it seems to be beneficial. Simbil, Thanks. I agree that sprinting reveals the limits of my current style. My neuromuscular coordination needs to improve, though I think I also have further progress to make with strength and power. At the moment the remnants of my recent episode of acute arthritis are still lingering, so I am doing neither drills that require rapid movement nor resistance work, but I will gradually reintroduce both over the next month or two. Also, I really must get some video recordings. You have commented on your blog that I have not answered your queries clearly. I am sorry and will do my best to provide a clearer response in this posting. To make things as clear as possible I will need to repeat things I have stated previosly, but I hope that the order of presentation of the ideas in this post will make the response clearer. In your second comment you asked me to elaborate on my views regarding the statement by Fletcher, Dunn and Romanov about the contribution of gravity made in the paper presented at the conference in Limerick. I have no objection to the author’s statement that gravity completes no net work during stance in constant speed running. However if Dr Romanov has been aware of this since 2004, his presentation in his book ‘Pose Method of Running’ of the yacht analogy in which wind pressure does work on the sails, and the tree felling analogy in which the centre of gravity of the tree falls as it is felled, to illustrate the principles of Pose are very misleading. The statement by Fletcher, Dunn and Romanov that gravity achieves angular work is correct but of very little relevance at least during constant speed running. Why does he not point out that gravity also achieves angular work in a head back and down direction during early stance? Even more importantly, why does he not point out that the angular work (which produces rotation) does not produce forward propulsion? Equation 1a in the paper by Fletcher, Dunn and Romanov, which is based on Newton’s second law of motion, correctly demonstrates that it is horizontal GRF that produces forward propulsion during accelerated running yet one of the main claims the authors make in their paper is that maximum horizontal GRF does not coincide with forward acceleration and hence is unlikely to make a major contribution to acceleration. They make no attempt to explain the contradiction between their conclusion and equation 1a. Without access to the raw data, it is impossible to be sure of the nature of their error. I think it is possible that their estimation of the point of maximum forward acceleration is incorrect due to incorrect estimation of the location of the centre of gravity of the body – this is a tricky computation during acceleration as the legs (which have non-trivial mass) undergo a rapidly changing displacement relative to the torso. I agree that leaning forward helps you accelerate. I also believe that unbalancing due to gravitational torque prompts a strong push against the ground that accelerates the body and prevent s face-down crash. I do not agree with your statement that you can eliminate the possibility that you are using anything other than gravitational torque. Although the force plate data presented in the paper by Fletcher, Dunn and Romanov is possibly misleading, it does demonstrates that there is a substantial horizontal GRF. I suspect that push against the ground due to either active muscular contraction or release of stored elastic energy makes a substantial contribution to this horizontal GRF. I hope this is clearer. I am grateful for your interest and for your comments. Thank you for following up. I replied to you in my blog. Basically I said that I really want to take the time to study your hypothesis, and any supporting studies you site, before I continue to ask questions or make comments. (I hope to do this soon). You have some very interesting ideas, and I want explore them more fully. Ken, Thanks for your continuing interest. I look forward to your future comments or questions. Well, unfortunately I disagree with almost every point you make in regards to problems about POSE METHOD. So, no point really in us discussing your position..however in light of all your views on POSE METHOD it seems that you would be better off making your own technique for running that your followers could use as an alternative to Pose and the other varies options. What is keeping you from putting down into theory and application your own develope and athlete tested technique for running? Currently it seems you only have bits and pieces. Anyways good luck with all your thinking, writing and running if/when you get back to it. My goal is not to develop a single technique of running or to encourage everyone to agree with me. I do believe, like Dr Romanov, that running style matters, and I think there are certain principles that help us develop the style that suits our circumstances and goals. However, I do not believe that there is one ‘best’ way of running. Principles such as the increase in efficiency with increasing cadence appear to be true only up to a certain point, and that point probably depends on one’s goals. For a sprinter speed is paramount; for a marathon runner efficiency (i.e. minimizing oxygen consumption) matters. For a sprinter, an action that might produce a repetitive strain injury after hundreds of thousands of foot-strikes does not matter much; to an ultra-marathon runner it does. For a recreational runner with limited time to develop strength and resilience, a relatively soft landing is probably best; for an elite middle-distance runner who has the time to develop a high level of strength and resilience, a somewhat stiffer landing might be more effective. It is only by analyzing the advantages and disadvantages of various features of running style that an individual can work out what is best for him or her. In the days when many different experts including Jack Cady, Cabletow, nrg-b, MsM, MJB and yourself contributed regularly to discussion on the Fetch efficient running thread, I found it a very useful source of ideas – though the volume of postings was so large that it was often difficult to find the gold nuggets amongst the chat. Over time that discussion thread became more dominated by Pose and arguments became more heavily based on belief than debate. Individuals such as Jack Cady dropped out and Cabletow became a Pose disciple. At that stage I decided that I might get more value for the time I could afford to spend on matters related to running, by devoting time to my own blog. I think that has turned out to be true. I have learned quite a lot from the discussions on my site. The fact that my site gets several thousand page views per month (well over 7 thousand in the past three months) suggests that other people at least find it interesting even if they disagree with my opinions. I am happy to continue posting and am especially I delighted when people make comments – both comments that agree with my views also those that disagree. I have both enjoyed and learned from the debates with thoughtful Pose runners such as Simbil and Peluko. Meanwhile the Pose enthusiasts from the Fetch efficient running thread have moved their attention mainly to the Fetch Pose thread. I read that thread from time to time and am delighted to see that a number of Pose beginners have made very good progress. However that thread is mainly a support site for people who want to learn Pose. As I have remarked previously, apart from some details of foot dynamics, I think Pose is a good style for recreational runners, despite the questionable underlying biomechanical theory and marketing methods. It would probably not be helpful to engage in debate about running biomechanics on that thread at the present time. Thank you for your wishes of good luck with my running. I will certainly persist with my goal of trying to run as fast as is practical for an ‘oldie’ with my various relatively minor health problems, and I hope to run a good marathon in 2012. I wish you well with your running. Thanks for your post. I have tried a few times to read/watch some of Dr Romanov’s material, and while it does seem like what he teaches is correct in terms of how to run, I think that his use of the term gravity is simply BS and overcomplicated drills are simply smoke and mirrors marketing. I always end up grinding my teeth when I try to read anything by by Dr Romanov. Just thought i would add to the discussion, i haven’t had time to read all the comments, the word ‘push’ is associated with thought. Where with GRF there is no time for such thought as it our unconcious ability to react to this force that gives us airbourne time. The greater the force the bigger the reaction, the bigger the jump. This is called our stretch reflex or our elastic energy system. Push is a dirty word for the pose technique and understandably because, pushing from a bad biomachnical position will incur injury, like in a longer stride pattern associated with the heel strike. Change the wording a little from ‘push’ to reaction, which i think is more appropriate due to the unconcious speed of it all and we all fall behind a technique that reduces braking forces by landing you in a better position to move forward which can be found by applying the pose, fall & pull technique. The russian olympic team in their hay day weren’t allowed to go running in less they could jump from 12ft, barefoot and land it. The coaches knew this would keep injury at bay and increase performance. I agree that the word push can create an unhelpful mental image, and that the term reaction might be better. Nonetheless, it is important to be aware of the large vertical forces that occur and to prepare oneself to deal with these. In my opinion the Pose expression ‘pose, fall, pull’ does not draw adequate attention to the need to prepare to deal with the large ground reaction force. The information about the Russian athletes being expected to cope with the vertical forces resulting from a 12 foot jump is very interesting. I tried Pose in June 2011. While it greatly reduced impact to my damaged lumbar disk delighting me with hope, it promptly induced plantar fasciitis in my left foot. While not severe, it has persisted for five months. Warnings and conditioning against this should be provided by Dr. Romanov. His discussion of this problem online is evasive in my opinion. In my opinion, Dr. Romanov has been quite clear about this. Assuming that your technique was sound to begin with (and that is a big assumption), Plantar fasciitis is usually caused by doing too much too soon. In my experience, most people who take up Pose ignore the advice to take it slowly, and then wonder why they get injured. I am sorry to hear about your troubles with plantar fasciitis. Ken, while it is very difficult to disprove that a runner suffered an injury due to imperfect technique and/or doing too much too soon, this response is a common response by Pose advocates to any injury reported by a novice, and in my opinion it tends to confirm the suspicion that Pose coaches are evasive regarding Pose-related the injuries. I would not want to make a judgment about an individual runner’s technique without either direct observation or examination of a video recording. Nonetheless, I think there is a serious risk that a runner who models his gait on the illustrations in Dr Romanov’s book ‘Pose Method of Running’ is potentially at risk of plantar fasciitis and Achilles tendonitis. Figure 11.3 which is a diagram illustrating the Pose stance; fig 38.27, a photo of Dr Romanov which is captioned ‘The perfect running pose’; and many other illustrations in the book, show the heel high off the ground near mid-stance. I think it is very difficult to maintain this posture without a fairly strong contraction of the calf muscles at the instant when the calf muscle, the Achilles tendon and the plantar fascia are undergoing a strong stretch due to impact. There should be enough tension in the Achilles to ensure that the energy of impact is converted to elastic energy, but a strong calf contraction at this stage creates a risk of damage to muscle, tendon and fascia. Several Pose coaches with whom I have discussed this emphasize in private that it is important to allow the heel to touch the ground, but it is very difficult to get a clear public acknowledgment that there are risks associated with Pose technique as presented in the illustrations in Dr Romanov’s book. Interestingly, Dr Romanov himself has produced a video clip on plantar fasciitis that emphasises the danger of active calf contraction ( http://www.youtube.com/watch?v=uLzxbkbdGmo&feature=player_embedded ). In fact I think the small amplitude two-footed bouncing with relaxed, neutral ankle which he illustrates in that video is a useful exercise for strengthening the fascia and protecting against PF (and perhaps also to promote recovery provided it is done very sparingly). I would be much more impressed by Pose if the Pose Tech site had a section concerning risks associated with Pose, including a clear discussion of the evidence indicating that Pose can increase the stresses in the vicinity of the ankle joint (as demonstrated in the Capetown study by Arendse et al), and a strong recommendation to avoid active contraction of the calf while on stance. It’s a common response, because that is the experience of most Pose coaches. Most people who get injured are either doing too much too soon, not performing the technique correctly and often both. I have never seen anyone get injured who has both mastered the technique, and allowed sufficient time for his or her body to adapt. I think Dr. Romanov has been clear about these subjects. However you seemed determined to find a conspiracy, so believe what you want. As for your comments on the book. I agree that the book is not perfect, and Dr. Romanov has told me that if he were to write it today it would be substantially different. There is a sense in which it is almost always true to say that if a runner gets injured he/she was doing ‘too much’ of what caused the injury. However when the nature of the injury is what might be expected from attempting to adopt the pose illustrated in Dr Romanov’s ‘imperfect’ book, it might be more helpful to start by trying to understand the origins of the injury. Fortunately, at least in private, some Pose coaches do adopt a more thoughtful approach. In fact the question of the relative merits and risks of forefoot strike, midfoot and ball of the foot landing are not straightforward. Even Daniel Lieberman whose paper in the highly regarded scientific journal ‘Nature’ on foot-strike in barefoot runners was published in January 2010, was careful to point out that the evidence he presented did not provide compelling grounds for recommending fore-foot landing. The fact that a careful scientist concludes that the evidence does not provide a clear recommendation for practice should be a warning that dogmatic assertions are unwarranted. Nonetheless, in practice we have to make a decision. My own view, based largely on anecdote, personal experience, and consideration of biomechanics, is that the distribution of pressure on the foot during stance should be adjusted according to terrain, speed, duration, and also the runner’s musculoskeletal structure. In many circumstances, a midfoot landing, with weight distributed between forefoot and heel but with a slightly greater allocation of load to the forefoot, is preferable. While running downhill, when impact forces are greater, or while running on ground with lots of pebbles, I consciously aim to achieve an equal a distribution between forefoot and heel. When sprinting, I land on the forefoot; during a half marathon or marathon, I aim for only a slightly greater loading of the fore-foot than heel, because the stress of thousands of repeated impacts increases the risk of injury. I think it is helpful to develop a keen awareness of how the pressure is distributed whilst running, though as an elderly person with reduced fat pads beneath my downward protruding metatarsal heads, I prefer shoes with a moderate amount of padding beneath the forefoot. I think the answer to this question is no. I address this question in some detail in a blog posting on 11th March 2012. The Pose theory based on the three key techniques, Pose, Fall , Pull is not a realistic description of running. The centre of mass rises after mid-stance. There is no fall. The Pose illusion that a strong push against the ground is not required when running is potentially beneficial to recreational runners whose main goal is to run a modest pace with a low risk of injury, but this illusion is not helpful for a sprinter. Fast sprinters exert a strong push against the ground. This is predicted by biomechanical principles and was demonstrated in the study by Weyand published in J Appl Physiol 89: 1991–1999, 2000.
t seems that one of the wonders of the internet is that we’re exposed to more and more B.S. A lot of that B.S. doesn’t make much difference one way or another, but there are many cases where the B.S. can hurt people in big ways or small. In the grand scheme of things, the B.S. that is “pose running” is small, but it will have a negative impact on people doing something that I care about. Those who are pushing “pose running” either know very little about running, or they are choosing to misrepresent what we know about running. I suspect it’s a combination of both. Proponents claim that nearly all elite runners, whether they know it or not, use the technique. Yet if you look at pictures of elite runners, such as Mo Farah, Galen Rupp, or Haile Gebrselassie (or Steve Prefontaine or Frank Shorter from a different generation), you’ll see significant ways that they are not “pose running.” They aren’t landing on the balls of their feet, sometimes even when they’re sprinting. Some of them lean forward, as “pose running” pushes (though I’m not sure what “forward lean from the ankles” means when you’re running–that just seems nonsensical), but some, like Frank Shorter, have no perceptible forward lean. The picture of Pre and Frank together shows two very different running styles, with Pre leaning forward (even though Bill Bowerman was a strong proponent of an erect running style), and the vertical style of Frank Shorter. Both styles were obviously very effective. Note that Pre’s toe is higher than his heel as his foot is about to strike the ground. He’s not landing on the ball of his foot. It turns out that the increased work load of the ankle is a problem. Proponents also claim that the technique is more efficient, and that using it will help you run faster. Of course, if you’re injured all the time, you’re not likely to get many PRs, but it turns out that the one study of the efficiency of the technique found that it is LESS efficient. One of the problems is the claim that it is THE RIGHT TECHNIQUE for everyone. I’ve been a runner and a fan of running for a long time. I’ve run quite a bit, run with others quite a bit, and I’ve watched quite a bit of elite runners. And I’ve seen that runners have a wide range of styles, and that a person’s form is an unreliable predictor of their speed or their ability to avoid injury. The picture of Steve Prefontaine and Frank Shorter tells that story. The last thing is a bit from the followup to the study that looked at knee and ankle issues–the subjects’ enjoyment of running was decreased from having to concentrate so hard on their technique. That’s the trifecta of bad results–it appears to make people more injury prone, it is less efficient, and it decreases enjoyment. If you’re a runner, particularly if you’re new to running, you may encounter people who will try to convince you that “pose running” is THE ANSWER. I hope I’ve demonstrated why it’s likely not even AN answer. 1) Pose encourages a decreased volume of running while developing helpful neuromuscular coordination and strength by performance of some useful drills. However the runner will probably suffer a loss of fitness during this period. There may be better ways to enhance neuromuscular coordination and strength without loss of fitness. 2) the imagery of Pose encourages a rapid lift off from stance, which can be useful, although Pose is misleading in failing to emphasize that getting of stance quickly requires a strong push. 3) Pose can be helpful for a runner who tries too hard to push forwards. Unless the runner has very well developed neuromuscular coordination, consciously pushing while on stance is likely to result in prolonged stance and subsequent over-striding. On the other hand, under-emphasis on the magnitude of the push can create a risk of injury due to underestimating the stress that forefoot strike landing on the ankle and forefoot. Micheal most of your statements about the Pose community and what it claims are inaccurate. First of all, there are many people who are proponents of Pose, and almost all of them are human. They can misinterpret information like anyone else. Are there proponents out there saying things about Pose that are incorrect? Yes definitely. However they are inaccurately representing what Dr. Romanov teaches. In fact I gave a presentation at a gathering of Pose Coaches on this very subject. I would further add that there is a lot of confusion stemming from cultural differences and linguistic misinterpretations. Dr. Romanov is not very fluent in English, and has had to depend on others to translate his ideas from Russian. This has led to widespread confusions over what Dr. Romanov actually teaches. Culturally, every college educated Russian is expected to be familiar with Newtonian physics, he was shocked when I told him this was not true of many college educated Americans (as was my Russian wife). Fortunately I have direct access to Dr. Romanov, and have discussed most of these subjects with him. So here are my corrections to your staments. There is no such claim by Dr. Romanov that most elite runners use Pose technique whether they know it or not. The claim is actually that very few Elite distance runners run using Pose technique. Dr. Romanov does claim that some (not all, or even most) elite sprinters do. Those claims are objectively verifiable by anyone who knows how to evaluate technique using Pose criteria. As a Pose coach, I do not have any scientific studies as evidence that Pose reduces injuries. I do have a wealth of accumulated experience that indicates this is true. Unfortunately, to the best of my knowledge, there are no studies comparing runners verifiably competent at Pose technique with other runners regarding injury (or anything else for that matter.). There are some very poorly designed studies (to which you referred via your links), which really only managed to prove that if people are trained incorrectly while learning Pose, will likely suffer injuries. I can say that my experience definitely bears this out. So do not train as the runners in those studies were trained, unless of course you what to get injured. You state that proponents claim Pose is the “right” technique for everybody. This is more or less true. Dr. Romanov claims that it is most efficient way for everyone to run. This is statement that is directly related to Pose theory. If his theories are correct, then he is probably correct. If his theories are wrong, then he may be wrong. Your point that technique is a very poor indicator of success in running is one that Dr. Romanov often makes himself. However, according to Dr. Romanov, this is mostly just true for distance running. He has always stated that the most important factors for in success in distance running are physiological. Your point about having to concentrate hard while using Pose is only true for beginners. Changing one’s technique at most athletic activates will require a great deal of concentration. Personally, I’m rather shocked that this is a surprise to running community. However, as people practice Pose technique, and become proficient at it, it does become second nature requiring little to no conscious thought. I hope I have cleared up a little. If you need more clarifications just ask. “Do all elite athletes use the Pose Method? I just read what I wrote. Sorry for all the typos. I too have spoken to Dr Romanov. On that occasion, his English was not bad and was in fact good enough to demonstrate that he demanded unconditional acceptance of his authority and was unwilling to discuss the biomechanics of running in an objective manner. His problem appeared to be an inflexible manner rather than difficulty with language. He employed quite skilled communication in a way that was misleading about the merits of Pose. He used the ‘eyes closed‘ uphill running trick to imply that Pose greatly reduced the effort required to run uphill. Dr Romanov does not claim that most elites use Pose but he has claimed that Usain Bolt runs with Pose style. This claim is erroneous. Objective measurement from video recordings demonstrates that Bolt’s COG rises after mid-stance rather than falling as Pose theory predicts. Subjectively , Bolt believes he pushes. Well, I made no statement about his communication style. However, we disagree completely on his fluency in English. I don’t think his English is very good, and I have consistently seen him use Russian expressions and grammar that are confusing in English. The uphill demo is not a demo of Pose reducing the effort of running uphill. It is demo about elements of perception. As for Bolt. I will ask Dr. Romanov about it. Do you have access to data taken from Bolt’s video? Even if Usain Bolt uses Pose technique, or something close to it, I don’t think it bolsters the case for Pose very much. He’s a sprinter. Sprinters naturally land on the balls of their feet, as do distance runners at the end of races when they’re sprinting. But Pose claims to be right for all runners, all the time. It makes no sense to me to tell people to land on the balls of their feet when they’re running a marathon. I agree that uphill running with closed eyes is a demo of the effects of perception. However, Dr Romanov did not make that clear. I accept that there was a communication failure, but I do not think it was a failure due to language difficulties. I think it was a consequence of the use of context to imply an advantage of Pose. Well, what ever happened, concerning your experiences with Dr Romanov there is no way to discuss it here objectively. I was not there. However, I’ve worked with Dr. Romanov for many years now. In my opinion, he is NOT good at communicating his ideas in English, and he is often prone to exaggeration and over-simplification when addressing an audience that is often not ready for detailed discussions about running technique. I stand by my assertion that his English has lead to a lot of confusion (both directly and indirectly) about his ideas. Fortunately for me I’ve had the chance to discuss these topics with him directly over time, and have come to realize that is much more to his ideas than what is easily obtained from weekend seminars, the PoseTech website, or the Pose books. The next chance I have to talk with Dr. Romanov, I’ll ask him about your comments on Bolt. I suspect that I know what his explanation is, but I’ll check with him for accuracy. Pre’s toes are higher than his heel right before his foot is about to land. It looks like Frank is likely to land a little farther forward on his foot, most likely either a light heel-strike of a mid-foot strike. By the way, I’m naturally more of a mid-foot striker. When I’m getting back into running, though, I have to consciously use a heel-strike style to avoid injury–mid-foot striking places more stress on my calf and achilles tendon. Michael, I stated that there are many errors and exaggerations on the Pose website. It is simply a fact, and I explained some of the reasons why they are there. I’m not going to go through them item by item. I just don’t have the time. I’m sorry. If you want to do this over time by email or phone I’ll be glad to do so. As for the study. How is this a “best case scenario”? By my estimation it was a “worst case”. The runners were trying to change their technique while maintaining their training volume and intensity. That’s practically asking for failure, injury, or both. Every Pose coach I know starts by having experiences runners reduce their training volume and intensity to focus on technique, and to allow the runner’s bodies time to adapt running differently. Landing on the balls of your feet without effort has to do with how you move your legs, not all sprinters naturally land on the balls of their feet. Many of them require training to learn how, the same is true for distance runners as well. The difference is that distance running is not nearly as dependent on technique for success. So most sprinters learn technique, and most distance runners don’t bother. As for the forefoot vs heel strike thing, you are completely missing the larger context. There are lot’s of forefoot runners with poor technique. Simply comparing runners base on this limited criteria is going to be unproductive. A forefoot landing does not by itself mean the runner has good (or bad) technique. In fact, if a runner is trying to force a forefoot landing, he is asking for injury. As for using gravity to your advantage. According to Dr. Romanov, yes, you don’t want unnecessary up and down motion, but you cannot eliminate it completely. Gravity via gravitational torque (gravity acting over a lever) has horizontal component. Dr. Romanov believes this is how runners move forward. The author of this blog argues otherwise. It has been discussed ad nauseum above. Again if you want to discuss it with me over time by some other means just let me know. I’ll be glad to do so. It’s too complex to hash out efficiently in an unstructured forum like this. I hope that helps, but it’s clear to me that you are not very familiar with Pose concepts as they are taught by Dr. Romanov. So I would encourage you do discuss them in more detail with me. If I can’t answer your questions, I can ask Dr. Romanov directly. If at that point you wish to discredit Pose, at least you can do so with accurate information. First off, if the official website has false and misleading information, how am I to trust anything about the technique? Second, the study involved runners trained by Romanov and his team, with individual instruction for each runner. If there are problems with the study, then Romanov is to blame, and it’s unlikely that ordinary runners are going to get that kind of attention. Third, you’ve come to the crux of it with this statement: “Distance running is not nearly as dependent on technique for success.” Bingo! You can’t simultaneously tell us that Pose is the key to running faster, yet also say technique is not an important factor to success. How many medalists in distance events at the last few Olympics and World Championships have been trained by Dr. Romanov? First – I already addressed the website. There are issues with it. What more do you want me to say? I don’t have the ability, or the time to make corrections to it. Second – Your knowledge of the study is not accurate. Dr. Romanov’s only role in the study was the initial training of Pose to both the trainers and the runners. He had no role in the design or execution of the study. They did not follow his training methods in the design of the study. Third – I never made the claim that technique is the key to running faster. I do believe that it plays a role. I’ve already stated that Dr. Romanov believes similarly. Forth – This question is irrelevant, it depends entirely on his having access to people who have medal potential. However, I do know that he is currently working with the Russian Triathlon team. The question you should be asking is how many people who he’s trained have improved significantly? I don’t have hard numbers. But everyone I do know who has trained with him, has improved significantly. Your statement (in response to my comment above that I found Dr Romanov’s use of English adequate) that Dr Romanov ‘is often prone to exaggeration and over-simplification when addressing an audience that is often not ready for detailed discussions about running technique’ was not relevant to the meeting in Loughborough. The audience at Loughborough was well prepared for detailed discussion. It included several of the most expert Pose coaches in Europe. 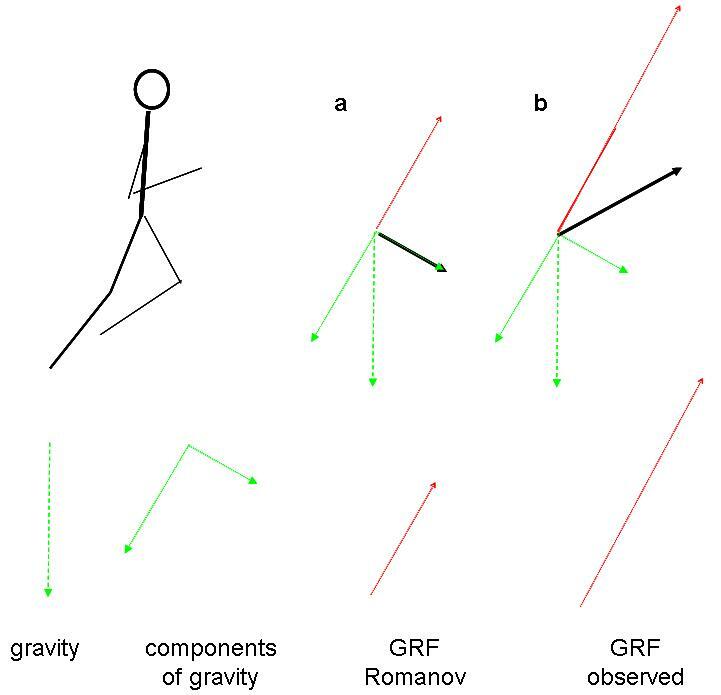 I explicitly sought Dr Romanov’s response to the difference between his understanding of GRF as presented in Romanov & Fletcher (Sports Biomechanics, 2007) and the observational data as depicted in the figure illustrating the forces acting on a runner after mid-stance in my post above. He refused to discuss this. This was not a language difficulty and it was not due to the audience being unprepared for detailed discussion. Your statement ( in response to Michael) that Dr Romanov’ s belief that runners move forward propelled by the horizontal component to gravity ‘has been discussed ad nauseum above’ is not true. I am still awaiting any response by an advocate of Pose to my argument that the horizontal propulsive force is the horizontal component of GRF. Sorry for the above. Replied to wrong pose. Well, Again I can’t directly address your interactions with Dr. Romanov. Besides I was not really commenting on your specific experiences with him. I was making a more general comment about why I believe there is so much confusion about Pose. On your second point. My mistake. I thought this had been discussed here. I must have mixed this discussion up with other discussions I’ve read. I apologize for my error. As far as a response to your claims about the GRF. I do know Dr. Romanov has addressed this topic in the past. Again all I can do is go to the source and ask for comment, and try to dig up what he has said about it. I certainly don’t consider myself expert enough to address your question directly. Thank you for your comments. As I think you know, I do consider that in practice, Pose can be a beneficial style for many recreational runners, especially for those who try too hard to push off stance with a poorly coordinated push and end up over striding. I know many who have benefited from Pose. I also know many Pose coaches, and in most instances, respect them as responsible coaches with the ability to analyse an individual’s running style and make helpful suggestions for change. However, as I have discussed in the above post, I consider that the theory of Pose is unsound, and furthermore, think it would be better if Dr Romanov and PoseTech were more open in discussing the limitations and risks of Pose. There may be a few limited cases where Pose can be beneficial, but I think those cases likely are very rare. Sort of like the time I took a couple of aspirin for an upset stomach and it worked. It’s cool that it worked, but it’s an unlikely occurance. The one person I’ve known who used Pose running (along with CrossFit Endurance) injured his achilles tendon within a month or so of switching to Pose technique. 1)	Appropriate-adjustment of the style to allow the heel to touch the ground during stance (mentioned in the 2002 edition of Pose Method’ but not discussed in an adequately open manner, and confounded by the accompanying misleading illustrations). 2)	Reducing training volume substantially while learning Pose – but the question of how substantial this reduction needs to be is not clear. Pose coaches simply blame runners for bad technique or for not cutting back their training volume enough if they suffer injury, rather than openly discussing the risks of Pose. 3)	Regular performance of slow eccentric contractions of the calf muscles to enhance the function of the Achilles tendon. I believe that if Dr Romanov, PoseTech and Pose coaches were prepared to address this issue openly and frankly, this would help both Pose and the recreational running community. It makes no sense to me to be telling newbie runners to be landing on their toes–that’s putting a lot of stress on their achilles, calves, and feet, and Pose proponents don’t seem to address that. That mirrors my own experience–if I haven’t run for awhile, I have to deviate from my natural mid-foot strike and consciously run with a heel-strike, or else I run into achilles tendon or calf problems. I think for many runners, the one “technical” thing that would help them would be to learn to relax while running fast. That will pay off in a multitude of ways, and doesn’t lead to the mental stress of concentrating on complex movements. But I suppose it’s harder to charge money to tell people to relax. You exaggerate a little with the term ‘landing on the toes’. However I consider that Dr Romanov and the Pose organization have earned much of the criticism that is heaped upon Pose as a result of their refusal to acknowledge adequately that forefoot landing does place great stress on the connective tissues around the ankle, including Achilles tendon. The increased stress at the ankle was clearly documented in the Arendese report on the Capetown study, but as you have pointed out, the Pose organization under-emphasizes this finding. Good Pose coaches acknowledge this in private and advise the runners they coach do allow the heel to touch the ground during stance. However despite adjusting their coaching practice to take account of the evidence, they are reluctant to discuss this in public. Sometimes they appear to act like gurus who feel they must preserve the faith of their disciples. An unfortunate consequence of this ‘economy with the truth’ about the risks of Pose is the widespread and justified distrust of Pose by many outside the Pose ‘faith’. However despite the fact that is it based on faulty theory and also includes some risks, including risks to Achilles and metatarsals, Pose does include some features which I regard as potentially beneficial for recreational athletes, It is very frustrating that the rigid attiudes of the Pose organization have undermined what is potentially good about Pose. I don’t mind criticism of Pose. In fact I encourage it, but much of what you are saying is not very accurate, or at the very least it not current. In every single training session I’ve attended with Dr. Romanov he has said that it is perfectly fine if the heel touches the ground. Every Pose coach I know also echoes this. Yes, I know that Dr. Romanov did teach “no heel touch” in the past, but he definitely is not teaching that now, and most Pose coaches have adjusted their coaching practices. Of course there are probably still some coaches who may not have “received the memo”, but most of the active coaches no longer teach this. Earlier you mentioned that “most” Pose coaches are reluctant to discuss injuries related to the forefoot landing. That is actually a big topic of discussion among Pose coaches. I discuss it often on public forums. You seem to be of the opinion that there is some “nefarious conspiracy of silence” involving Dr. Romanov and the Pose Coaches. However, many, or most, Pose coaches are not trained in the sciences, and are not even interested in the disputes over bio-mechanics, theory, and the results of various studies. Most of them come to Pose because it helped them with their running. Many of them don’t really care what Dr. Romanov says or believes, beyond practical application. There are also many Pose coaches who openly express doubt about many of the ideas and concepts Dr Romanov teaches. However, they wouldn’t continue to train with him if they weren’t getting and seeing results. I read you blog because, you have a lot of interesting ideas, and you usually seem to offer good supporting evidence to back up what you are saying. In other words, you seem to be a person of intellectual integrity. So, whatever your opinions about Dr. Romanov and his theories are, I hope you might consider that your perceptions about the coaches, and what they teach, may be dated and/or based on a limited data set. I am well aware there are sensible discussions about the risks of forefoot strike among Pose coaches. However, it is not all that long ago that I was the engaged in a discussion on Pose Tech in which I repeated some of the sensible advice that a level-four Pose coach had discussed with me in private about the forefoot landing issue. I was comprehensively attacked not only by many Pose enthusiasts but also by Dr Romanov’s daughter. Even the Pose coach whose opinion I had quoted reverted to defending the misleading diagrams in Pose Method of Running. I accept that Pose attitudes towards honest, open discussion are gradually improving. However, I do not consider that the Pose organization have yet been adequately open about correcting its past errors. It is still relatively common to come across instances such as Michael’s friend who suffered Achilles problems. The Pose organization might say that his injury arose because he did not do Pose properly but that would be yet another example of the organization blaming the injured athlete rather than looking at their own role in creating this situation. The Pose emphasis on forefoot-strike is one problem. The claim that one technique is suitable for all runners in all situations is another. I’ve been around long enough that I’ve seen quite a few different styles of running, including one who looks like he has some sort of injury, yet he’s managed to run over 100 marathons and ultramarathons is with asymmetrical shuffle. That style most definitely wouldn’t work for me, but it clearly worked for him. I grew up watching Frank Shorter and Steve Prefontaine, two runners with very different styles, yet each was very effective. The one-size-fits-all approach just doesn’t make sense to me, just as the one-size-fits-all approach of CrossFit (which appears to have aligned itself with Pose) doesn’t make sense to me. If Pose were as effective as it’s claimed, I would think you’d see many runners in the sub-elite category using it, since they’re the ones with the most to gain. Are we seeing that? I agree that there is no single running style that is best for every runner. I think there are a few common features of most good running styles. These include a fairly high cadence (though there is an upper limit set by the fact that the energy required to reposition the limbs increase with cadence); and avoiding reaching forward with the swinging leg. Other aspects of style, including the angle of the torso, and the part of the foot that strikes first, are important but each runner needs to find what suits him or her best. I general, I think that if a runner is not suffering repeated injury, it is usually best to make no major changes. For recreational athletes who are not plagued by injury, simply training more systematically is likely to be more beneficial than changing style. Maybe for a professional who is striving for peak performance, change for the sake of greater efficiency is worth considering, but it is always a bit risky. I am interested that Alberto Salazar is currently trying to change Mo Farah’s style to make him more efficient for his marathon debut in April. To my eye, Mo might achieve a beneficial reduction in the stress on his legs if he increased cadence so that he did not have to push so hard. In a marathon, unnecessary stress on the legs can add substantially to fatigue. I do not know exactly what changes Alberto is encouraging Mo to make. It will be fascinating to see how Mo shapes up in London in April. I would be very curious how you would explain how a child or animals runs? Ken, I suspect that in most animals and human infants, the rudiments of running are programmed into the way that nerve cell connections the support the actions of walking and running develop as the brain develops . The emerging rudiments of running are then reinforced by non-conscious learning due to practice. Relevant connections in the brain are strengthened by practice. There is an inbuilt reward system in the brain that tends to re-inforce patterns of brain activity that produce positive results, such as proceeding rapidly in the desired direction, and discourages brain activity that leads to negative results, such as falling over. Well you are right in that they fall over if too much lean. They learn that’s too much and correct that fall adjusting to maintain a run. But they unequivocally fall. They aren’t taught which muscles to fire etc. And they simply get themselves out of the way by unweighing their body off the planet. I have witnessed my own child learn this right in front fof my eyes It is absolutely the same way an animal runs. And there’s no way it understands which muscle to fire etc. And that is pose. Nothing more, nothing less. Unweighting requires a push against the ground. That is simple physics. Pose theory neglects the vertical push, but fortunately kids learn to do it. Even if Pose works for some people, they lose me when they claim that it’s the best way to run for everyone, all the time. Just from my own experience, I know that I’ve had to make some minor adjustments to my form when I’m coming back from a layoff, purposely running with more of a heel-strike, rather than my normal mid-foot strike, to take pressure off of my achilles tendon and calf. I would urge you to read chapter 15 of pose triathlon methods to more eloquently answer your response which discusses this exact issue. I cannot do it justice. I would also urge you to watch a toddler start to learn to run for example. There is no active push off. It was face plant or run. And they learn to harness that fall well. Unfortunately they grow up listening to gibberish from “experts” and start to run horribly. Michael. Quick question. How do you explain that everyone on the planet goes through the pose while running? Do you think you don’t even when you attempt to heel strike? I would urge you to watch film and then answer..it might surprise you. So then it begs the question why would you actively slam your foot in the ground and apply the brakes. You do realize pose method teaches you to do what we all 100% do anyway. So it IS for everyone. It simply trims the fat to the key movement pose. And Michael it is not running a midfoot strike. The support is on the ball of foot and is only a consequence of proper unweighing. The foot is only a support from which the fall can occur. So in essence you.have the.wrong concept from the start. You thank the modern day mechanists and shoe designers to thank. Ken, I suspect that if you let a toddler run across a force plate you would see the evidence of push off, though if the toddler does not actually become airborne, the push off would be slight. However, if a runner become airborne, the force exerted on the ground must exceed body weight. This is a simple consequence of the law of conservation of momentum, and is readily demonstrated in practice using a force plate. With regard to where to seek expert guidance, I think it is unwise to follow Dr Romanov. When I have spoken to him in the past he has appeared unable to grasp simply concepts of physics, such as the plausible magnitude of the vertical GRF during running. To follow a guru who does not himself understand simple biomechanics is unwise. I appreciate the advice. I’ll stick to the guy who can explain all of movement in a sentence. I’m finding it very difficult as a physician to understand how the concept of tilting forward and unweighing your foot/ side of body from the ground only and then running eludes people. Pretty simple experiment if you try it…..works every time. Unless you’re on the moon. Ken, You might be confusing the tilting movement that helps initiate the first few steps from the action required to maintain a running gait. If you compare figure 7 in that journal article by Fletcher and Romanov, with force plate data acquired during running (or with simple prediction based on the law of conservation of momentum) you will find that Dr Romanov has a poor understanding of biomechanics.. If anyone offers to explain all the movements of running in a single sentence, they are almost certainly offering a seriously inaccurate description. Well not really. Not sure how else he could do this pushing off…..you can’t. Sorry the force plate data from running in whom? Romanov? Bolt? I apologize the you tube video is Romanov running on ice. Please take a look if you’re interested. Not sure how you can run with a push off without breaking your neck. That might be a better visualization. When running on ice you must minimise horizontal push. A vertical push does not cause a problem. It is essential to employ a vertical push to get airborne. When running on ice it is preferable to be airborne for a substantial portion of the time. This minimises the horizontal forces associated with braking that tend to cause you to fall on your face. So, the art of running on ice is minimising the braking, thereby minimising the horizontal push, but this necessarily requires a vertical push. With regard to force plate data, any data you can find will do. I have never seen force plate data that did not demonstrate a substantial push. Ok. Can you explain how one knows to push horizontally or vertically in that instant split second while running on ice? The fact is that you cannot react fast enough to make that determination. You either don’t fall at all in which you stay still. Or if you lean forward to initiate and/or you try and push off or however else you want to try and start you’ll face plant because that push off will cause that foot to slip and.you’ll fall on your face. In any instance there is no way you will run as Romanov does on ice. It’s impossible as you describe. So that is how running on ice suits the true running model and not a contrived one. Ground plate data taken from bolt or romanov would be a different story. If you’re model of running involves active voluntary push of the ground (which has not been shown since the thigh is relaxed and absorptive) then it is very easy to demonstrate the ground plate data. It’s a self fulfilling prophecy. Perhaps if you want get out there and show how it’s done with a running analysis that would be fantastic. Romanov certainly does constantly with analysis of himself bolt and a myriad of other runners. The non-conscious brain can make decisions far more rapidly than the conscious brain. If you have the confidence to try running on ice your non-conscious brain will probably learn to minimize horizontal forces. With regard to why Dr Romanov can do it, I think there are several factors. From what I have observed of his running, it looks as if his non-conscious brain is very well attuned to running with a short time on stance. Unfortunately because of his apparently poor understanding of biomechanics, he does not appear to realise that this is because he is able to exert a strong vertical push. The other factor is that he runs with a high cadence on ice. That is probably a conscious decision – and in fact is a good decision. As you will note from my post above, I believe that Pose has good features as well as bad features. Its good features include encouragement of rapid cadence and short time on stance. These are generally beneficial features, though both features should be applied in moderation. A cadence that is too high results in excessive energy cost of repositioning the swinging leg. Time on stance that is too short necessitates excessive vertical force which costs energy and also might increase risk of injury. Efficient running requires a balance between the three main energy costs of running: getting airborne, overcoming braking , and repositioning of the swinging leg. Overall Pose theory includes some useful ideas, but due to a lack of understanding of the whole picture, it also includes some bad ideas. Pose helps some people and harms others. As far as I can see, Dr Romanov has a brain that is well-tuned to the requirements for dextrous movements of his feet. He is an inspirational coach. He also has some good ideas but unfortunately his overall understanding of biomechanics is seriously deficient. So again the ability for Dr Romanov to Sprint on ice is somehow a mystery and relies on some unconscious brain impulse. He must be different than anyone else on the planet or he simply falls allows his general center of mass to lever over the support in an instant. Seriously? The problem with your theory is that you cannot explain it without trying to say he must have some unconscious power that others do not have. As far as I know he simply is in pose. See that is the problem. You have a model yet when asked to try and fit that model to a particular situation it can’t hold water. If you seriously believe there is an active push off doing what he is doing then you cannot understand physics. And the way he runs is the same on ice or land. Guess what if you put bolt on ice he would do.the same thing. I guess they must be from the same different planet. Try it for yourself please and see what happens. There is nothing supernatural about unconscious motor control. A great deal is known about how it works,though there are still interesting questions for future research. Nonetheless, the essential principles of running on ice are easily understood. If you have the confidence to let your non-conscious brain make the required adjustments, there is a reasonable chance that you will develop the necessary skill to do it. Dr Romanov is skilful though not extraordinarily so. Thank you sir. You proved my point. It is the lack of fear of falling and removing ones own bodyweight at the right exact time is how we run. And that’s it. On ice it is highly exemplified because of the consequences. It’s reflexive at it’s highest form. It is that exact absolutely unadulterated “natural” unconscious response that is seen in nature, in children and in those who truly understand movement and simply allow it to happen. there is no conscious pushing. You cannot tell me he pushes off as you say in hat video. No way. You cannot explain it. And if you think romanov isn’t that skilled you really don’t appreciate movement. Please watch him do any Olympic lift or jump at his age even. He can do.whatever those athletes can do in the blink of an eye. Again please.post some videos for discussion. That’s only fair. It can explained quite easily. He runs with a high cadence and with a very short time on stance. The high cadence is under conscious control. The short time on stance requires precise timing. This requires non-conscious motor control, but it is a skill that is acquired fairly easily. It does not require a conscious push off but the push off nonetheless occurs, simply because if it didn’t he would not get airborne, That is a very simple consequence of Newtons law of motion. If your own memory of physics is a bit rusty, ask a smart high school student. Edit 22 Feb 2015: I apologise for the clumsy way in which I expressed this comment. However Newton’s Laws of Mechanics are a key part of the foundation of biomechanical theory. Your argument ignores these Laws. Without taking account of Newton’s Laws you cannot evaluate the argument that I am presenting. Yes I agree with the first part. Correct. The conscious action only in pose is lifting foot from the surface. The cadence can be altered depending on skill and surface encountered. And on this surface clearly the support time must be brief. Agreed. However there is.still no active voluntary contraction to push off. It can’t happen.since his gcm is already beyond his support. He can’t! If he did he would try and bound down the track or ice and that simply doesn’t happen. Just like bolt. His fall is so extreme he cannot active a push. He’s way ahead of gcm. If you.watch Romanov he runs identically at any speed or surface. The only difference the engine.which is his lean. Please find where there is a push off in that video or even in bolts Sprint. It can’t go any further. And please don’t insult my intelligence. Being firm, direct or even opinionated is one thing but going below the belt is another. I might have a few years of education considering an M.D. usually does. It is very likely that Dr R does not consciously push off. The main reason why it is helpful to have the confidence to let your non-conscious brain take control of the action when running on ice is to minimise interference by conscious action. Adjustment of action by conscious control is much slower than adjustment by non-conscious control mechanisms. Nonetheless, although the push might not be conscious, it is active in the sense that muscular contraction occurs. I do not know of anyone who has measured muscle contraction during running on ice, but as you point out Dr R uses similar style on dry land , and muscle contraction during running has been measured many times during running on various surfaces. Interestingly, the active contraction of the large muscle groups tends to occur a little sooner than you might expect, but it nonetheless occurs. However you are still failing to take account of the straightforward implication of the laws of physics, which cover human bodies as well as inanimate objects. To accelerate upwards requires the exertion of a vertical force (Newtons 1st law). This is achieved by pushing against the ground, producing and equal and opposite ground reaction force (Newtons 3rd law). Dr Romanov acknowledges the reality of ground reaction force but he seriously underestimates its magnitude. His estimate (as illustrated in figure 7 of the journal article by Fletcher and Romanov to which you provided the link link) shows a vertical ground reaction force less than the force of gravity on the body (i.e. body weight) yet force plate data shows that it is much greater than body weight., as would be predicted form Newtons 1st and 3rd laws. I am sorry that my clumsy wording appeared to insult your intelligence ,That was not my intention. But your arguments create the impression that you have forgotten Newtons laws. Indeed it is likely that many competent physicians have forgotten the elementary physics that they learned at school. But if you wish to evaluate arguments about biomechanics it is essential that you remind yourself of those laws. That is fine. I need no reminding. And I apologize if I misinterpreted your wording. As I’m sure other discussions about this have spun in circles with other pose coaches so too will this one. Please post a video of you, your technique and comparisons to Romanov or bolt etc.with their analyses. That is only fair since Romanov puts himself out there without hesitation..He walks the walk. Or he poses the pose. If you’re going to critique and point out his flawed model then you must show where it is flawed and how it can be more accurate in interpreting motion. And on camera. I am perfectly happy for you or anyone to offer criticism of my acount of running technique presented in my ‘Dance with the Devil’ artcile. But my own proposal regarding running technique is irrelevant to the question of whether or not Pose theory is flawed. I have presented the argument based on Newton’s Laws in my blog above and I repeated it in comments to you yesterday. Unless you can demonstrate that there is no need for a vertical GRF greater than body weight in order to get airborne, you have not refuted my argument. Nonetheless, I am happy to reiterate that I consider that Dr Romanov is skilful in the control of the movements of his feet, and furthermore that there are several good ideas in Pose theory, but there is also a serious flaw at the heart of the theory, most clearly illustrated by figure 7 in the article by Fletcher and Romanov. In that figure, vertical GRF is seriously under-estimated leading to the erronesu conclusion that the centre of mass falls after mid-stance. I apologize but I respectfully disagree. You still do not show the the flaw in video analysis where the voluntary active push off occurs. Please show it , literally. Or demonstrate it with your own analysis. You see his videos or bolts. Where is it? You simply ignore this request. Either you just don’t want to or more likely cannot find it. Have you even tried the drills? A change of support or pony for example? Or a running lunge? There is no push off from the calf! Simply lift your foot off the ground and then see. Your technique is quite relevant because it appears to have taken principles of pose and altered them in the proper running form. So we should all be able to see what that is exactly as well. That only lends credence and validity to you as a critic and as a running expert. But there is no video, no analysis, no demonstrations etc. It also does not account for movement that occurs all around us, animal human or anything else in one model. I’m not sure where the appropriate place to weigh in, so I’ll reply to the end of the thread. We can talk theory all we want, but where are the practical results? How many Olympians have trained with Dr. Romanov? How many Olympic medalists have trained with Dr. Romanov? As for the theory, for me, as someone who has been a runner and a fan of running for a long time (I ran my first marathon in 1971, and watched much of the 1972 and 1976 Olympic Trials in person), the theory doesn’t make sense to me. It may work for a few people, but when people talk about being “in pose” and “in stance,” you lose me. Those are, by definition, static conditions. Running is, by definition, a moving condition. When I’m running, I’m not ever “in pose.” I may move through a body position that some people identify as “pose,” but it doesn’t make sense to me to encourage people to concentrate on a particular position. Again, this may work for a few people, but I suspect that the number is relatively small, and most runners would see more improvement by concentrating on how their body moves, or not even worrying about their form and adding more variety (especially hills, and maybe some trail running). You do realize that the coaching issue is ego and politics. Romanov is likely considered some type of heretic and if no one chooses to accept his theory (which they will not because the concept of running is based on pushing and muscular action) he won’t get the opportunity. He has definitely coached Olympic level and proved athletes like in triathlon. Bolts coach for example has him doing all the inane non productive drills that are typically prescribed. Yet bolt does none of it in running. If Romanov was given the opportunity to work with him no one would touch bolt, ever. Bolt is one of the few athletes who perceives unweighing better than most. Like Phelps or Armstrong. Or even Federer. They are close to pose in their movements already. Wonder why they dominate a sport with longevity? The understanding that all pass through the pose should tell you that it is already there. Romanov didn’t create it. Nature did. He simply takes away all the rest of the fat. There is a tremendous incentive for those just below the top level to try different things. Which “Olympic level” athletes has Dr. Romanov worked with? How many have medaled? British, mexican triathlon teams that I know. You can look for yourself. You do realize that your question of athletes seeking alternate views is unanswerable. That all depends on the athlete. I don’t know them. It’s also absurd to speculate that Usain Bolt would do better with an unproven method. And, again, “Pose” is unproven. There is no track record of top runners using it. HE IS IN POSE! HE DOES IT BETTER THAN ANYONE IN THE WORLD. That’s the point. It’s right there. He thinks he does something just as spitz described a pull in swim. But he didn’t. He fell from support in the water. He undulated like a dolphin. So what an athlete believes he is doing and what happens on film can be very very different. Well, no. He’s not “in pose.” He’s running. He doesn’t have a “forward lean from the ankles” as Pose says you should have. Frankly, I don’t know what the hell that even means. His foot is landing ahead of his center of gravity, not under his body. He’d likely land on his face if he actually tried to do that. But even if Usain Bolt was using “Pose,” that doesn’t really mean anything for the claims of Pose, because Pose claims to be the right technique for all runners. And that’s absurd. Sprinting requires a different style of running than does middle-distance running, which, in turn, requires a different style of running from long-distance running. I apologize but I just can’t continue with this. I do not claim there is a voluntary push off. Indeed for many athletes it is probably better to deliberately avoid trying conscious micromanagement of the muscle contraction required during running. Non-conscious control mechanisms are far better for controlling the precise details of muscle recruitment. Video analysis is irrelevant to the question of whether control is conscious or unconscious. We cannot see conscious intention in a video. We can only make indirect inferences about conscious intent. Nonetheless, if we see that the body become airborne, Newton’s Laws allow us to be utterly confident that a push-off has occurred. You do not appear to offer any reasons for disagreeing with the point I am making. You appear to be trying to address a different question: does Dr Romanov exert a conscious push? I do not think we have any disagreement on this. I am prepared to accept Dr Romanov’s statements that imply that he is unware of the push, just as I accept Usain Bolt’s statements that he is consciously aware of the push. With regard my own proposals about running style, I am perfectly willing to debate them on any of the pages on which I present these proposals (eg the ‘Dance with the Devil’ page). The main issue I address on this page is the application of Newtons Laws to Pose theory. The validity of my main argument on this page depends on the validity of my understanding of Newtons Laws, not on any video analysis of my own running form. I do nonetheless accept that it might be useful if I presented a video analysis on the Dance with the Devil page . Producing clear and informative videos requires adequate time; an adequate camera, an assistant, and appropriate software. At present I do not have any of these, though none of them presents an insuperable challenge. One day I hope I will assemble all the required resources and I will then post some videos and look forward to your comments..
Fair enough. Perhaps we have agreed on more than not. At least perhaps we are opening our minds and that at very minimum is a good thing. I have some sympathy with your view that the theory is less important than the practical application. Nonetheless, I do think that if practical proposals are based on an erroneous theory, it is risky to turn a blind eye to the errors . I myself have learned useful things from Pose. I feel confident about the useful things I have learned because I have examined the nature of the errors..
At the practical level, I think that Pose can be a useful technique for recreational runners who try too hard to deliver a powerful push. Unless a runner is skilled, there is a risk that a conscious push after mid-stance will encourage too long a period on stance and consequent over-striding. So for such runners, Pose can be helpful. The emphasis on forefoot landing can also be useful for runners with knee problems though it does present the risk of excessive loading on the Achilles tendon and other structures around the ankle, as demonstrated in the Capetown study of Pose. Pose is unlikely to be useful for elite runners because they are likely to have exceptional ability to combine conscious awareness with the ability to allow the non-conscious brain to take control of the fine details . For such elite runners, accepting the need for a powerful push has encouraged them to develop the required power. This is the case for Usain Bolt, Paula Radcliffe and others. Note, like many runners Bolt does go through ‘pose’ at mid-stance, but he does not run in accord with Pose theory. His centre of mass rise rapidly after mid-stance, on account of the powerful push that he delivers. Perhaps Pose might also be useful for triathletes who are not specialist runners. Some triathletes, such as Tim Don, appear to have experimented with Pose and then moved on. Like I’ve said, Pose my provide some useful ideas for some people. It makes little sense to me, and my hunch is that it’s unlikely to be of much help to most runners. Many runners may benefit from some adjustment to how they run, but for most people, general tips (like “run erect” or “relax” or “lean forward when running downhill” or “shorten/lengthen your stride”) are likely to be more helpful than trying to get them to pay attention to specific points of their running motion (with foot-strike being a possible exception). I think we are in total agreement that for most runners, detailed micromanagement of muscles is not helpful. We agree that in most instances general instructions about the goal are more useful than details of how to achieve the goal. It is perhaps ironic that Pose can sometimes be helpful because it discourages people who consciously try to push too hard from doing so, but this is perhaps a rather back-handed way of achieving a beneficial outcome. At a practical level, I have seen some people benefit from coaching by Pose coaches, though the best Pose coaches I have observed in action place more reliance on their ability to identify errors such as reaching out too far with the swinging leg, or excessive tilt of the pelvis, than they place on specific Pose principles. Nonetheless exploring Pose allowed me to refine my own ideas. At a practical level, I find Change of Stance a useful drill for promoting a well-timed brisk push-off from stance..